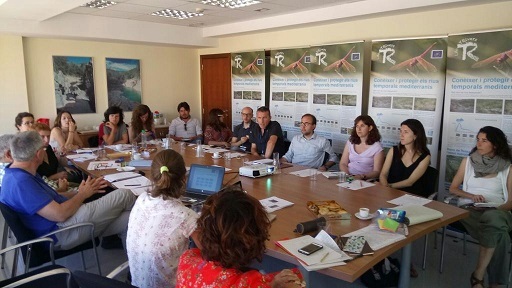 The Catalan Water Agency (ACA) hosted last week a meeting of the TRivers project. The aim of the meeting was to plan the participation process that aims at gathering measures for the conservation and restoration of temporary rivers. Representatives from the University of Barcelona (UB), the Spanish National Research Council (CSIC), ACA, the New Water Culture Foundation (FNCA) and the Júcar Hydrographic Confederation agreed on the actions to be taken during the next months. The new features of the citizen science app RiuNeT to be used in the participation process were also shared at the meeting. The citizen participation process will set up several workshops at different places of the Catalan River Basin District, and of the Júcar and Ebro River Basin Districts. In the workshops, researchers and citizens will discuss on those priority measures needed for the conservation and restoration of the ecological status of the studied water bodies. “This is a way for people to give their opinion on priority measures, but it also allows water managers to have more information for making better decisions”, said Narcís Prat. 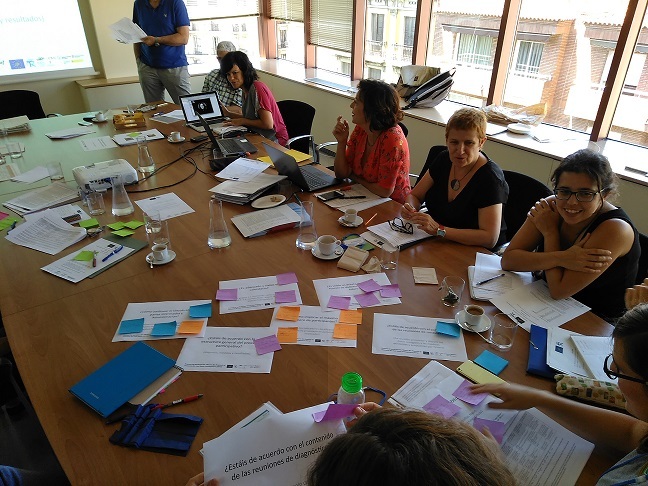 At the meeting, Iraima Verkaik (UB), Laura Sánchez and Alba Ballester (FNCA) coordinated a workshop with scientists, managers and representatives of the administration attending the workshop. “The workshop’s aim was to establish the schedule, tools and the disseminations actions of this initiative. The participation process will raise awareness of the temporary rivers and the importance of citizens’ participation in the management of these ecosystems,” said Iraima Verkaik. RiuNeT will be used as an engagement tool in the citizen participation process. This citizen project – recently awarded with the Environment Prize 2017 of the Generalitat of Catalonia -, guides citizens to assess the ecological status of rivers. The new hydrological features of this app were also explained in the meeting, which includes aquatic phase surveillance, classification of the river hydrological regime and the detection of hydrological impacts of all rivers. RiuNet app will still include the assessment of the ecological quality, including temporary rivers. A new section will also give the possibility to gather information on the river ecosystem services valued by the citizen. This new version of the app will be available in the following months to all citizens and certainly before the first meeting with participants. Most recent results of the project were also shared during the workshop. Francesc Gallart (CSIC) highlighted the development of a diagram that contributed to a better interpretation of a temporary river’s regime. The diagram has been included in the TREHS software, developed by TRivers. “This tool visualizes the degree of temporariness of rivers from the point of view of the river’s ecological attributes,” said Gallart. According to Narcís Prat, “this tool classifies the intermittent rivers from the point of view of the indicators that are necessary to assess ecological status”. Finally, Núria Cid (UB) reviewed the latest TRivers research on fish and macroinvertebrates communities. The challenge now is to study whether these communities respond differently to natural disturbances (natural temporal rivers) than to human activities (temporary rivers due to water abstraction).